Although bankruptcy laws were enacted to protect you, it is a tough experience for everyone. If your creditors are making things almost impossible for you, filing for bankruptcy might be your only solution. Bankruptcy laws are not the same everywhere in the U.S. Florida is quite liberal; in fact, in Florida you can keep many more properties than in any other state. In Florida, the law is there to protect your properties while making sure that your debtors maintain their specific assets throughout the entire bankruptcy process. This state is one of the opt-out states in the U.S., meaning that that the federal bankruptcy exemptions are not applicable in Florida. Florida defines a homestead as an individual’s principal residence, which is a maximum of half an acre if you live within the municipality, and 160 acres if you reside outside the municipality. If you live within the municipality, about five acres plus improvements will be exempted. If you live outside the municipality, about 160 acres of your land plus improvements will be exempted. Individuals living on leased dwellings, like a mobile home, are given 100% exemption. If the head-of-the-household earns below $750 each week after taxes, then the creditor cannot garnish his income. In Florida, chapter 7 applies to everything you own, and it varies depending on if you are using the homestead exemption. If you are using this exemption, then you can exempt some personal properties worth $1,000. But if you are not, then you are entitled to a full personal-properties exemption of about $4,000. Florida’s bankruptcy law allows you $1,000 for your vehicle, which you can claim as an exemption. This is referred to as the re-organization law, whereby the debtor who files for chapter 13 might be able to save most of his properties. In most chapter 13 bankruptcy cases, a 3-5 years repayment plan to repay all your past due debts must be approved. This reorganization form is designed for individuals or corporations with over $350,000 of unsecured loans or over $1,000,000 of secured debts. 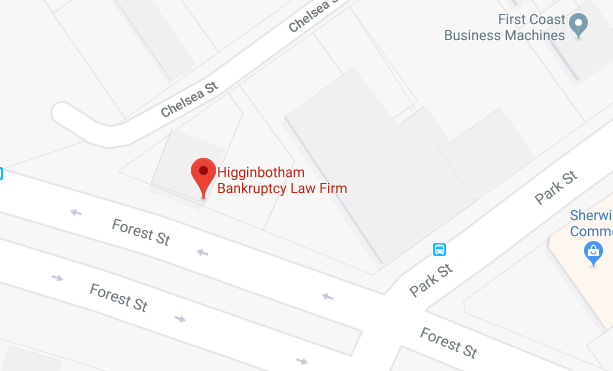 D.C. Higginbotham and his team have handled over 30,000 bankruptcy cases since he began practicing bankruptcy law in 1980. Instead of assigning you to a paralegal, like most firms do, Higginbotham or his partner will handle your case personally. After about an hour of consultation, most of your questions about bankruptcy will be answered and clients are left satisfied.